I had a major headache today. You know, the kind that you can feel coming on a few days in advance. Yeah, one of those. Unfortunately, I was a little too busy to take it easy. Also, my husband was out-of-town Sunday night, which always messes up my schedule. As in, I stay up way too late puttering around the apartment and am exhausted the next day. That’s my M.O. when he’s gone. It was manageable when it was just me and Little Man. Now that it’s me, Little Man, and Really Little Man, that behavior doesn’t fly. Plus I started teaching piano lessons again, which means that I use my “down time” during the day to make dinner for my husband so that he won’t have to wait three hours to eat something warm and nourishing. That’s how my Monday and Tuesday played out, and by Tuesday night, I was pretty useless. Part of the reason that I wasn’t getting enough rest is because I was still attempting, after a full day of mommying and a couple of hours of teaching in the evening, to keep the apartment in a clean state. 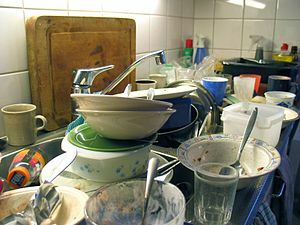 When I wake up to a counter of dirty dishes, it doesn’t set the best mood for my day. So even though I was trying to keep on top of things, I was just making myself more tired and/or stressed. One of my wiser and more experienced friends, after seeing me in my quasi-zombified state today, commanded me to get more sleep. She’s right. The dishes can wait. You have a wise friend. Good for you. Thank goodness for wise friends! when I look at my house right now, I want to stick a label under it that says ‘this is not my house’. Lol it’s really hard to balance everything sometimes. It really is. I find it comes in waves for me. For a couple of weeks I’ll feel really with-it, and then for a couple weeks it’s chaos. Hopefully, with more years of experience I’ll get a better hang of things. The most important thing is to take care of yourself and your family – so if the dishes (or laundry or whatever it is) don’t get done right away but your kids are happy, your husband is happy and you are happy, you are on the right track. The house will get cleaned. Eventually. Don’t stress too much! Intellectually I know that it’s true, but I just feel so much better when things are cleaned and organized! That said, I’m going to sleep tonight with dirty dishes on the counter and toys all over the house!